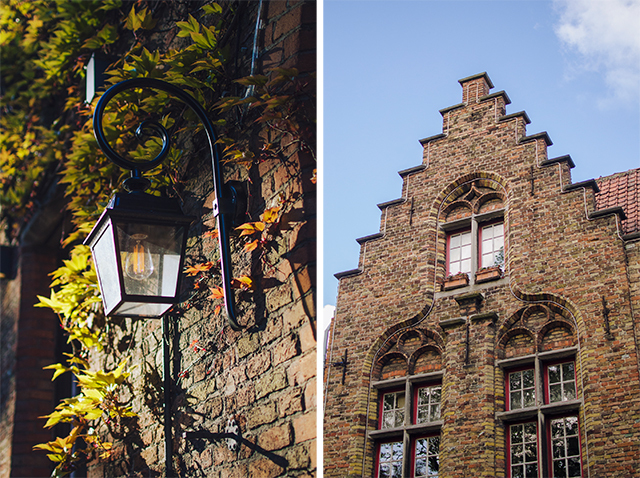 After a day in Antwerp to visit the Plantin Moretus Museum, I hopped on a train to see the beautiful little city of Brugge. 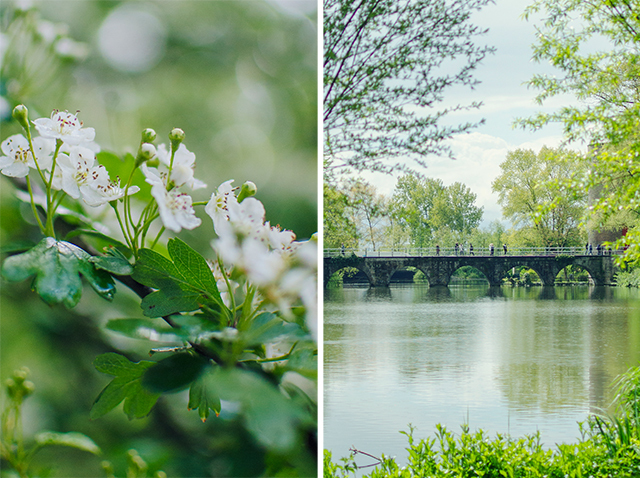 It's a place that I thought I wouldn't visit for quite a while; I knew it was lovely, but there were cities further up on my 'to see' list. However, with tickets for those under twenty-six being only €6 between any two destinations in Belgium, I couldn't resist a little stop-off. It was a fleeting visit - I arrived at around seven in the evening, and I was back at the station to catch my coach back to London before 1pm the next day - but as usual I crammed plenty of walking in! Getting to Bruges will usually require flying to Brussels, plus a train journey, but luckily the Belgian rail network is expansive, reasonably priced, comfortable and efficient (two storey trains!) and it's only just over an hour. The downside is that most of the flights will set you back around £100 each way, and adding transfers and train tickets bumps up the cost. A Eurostar ticket to Brussels is a cheaper option starting at around £60 return, but these seats book up fast - when I was searching three weeks in advance they had already increased to over £70 each way. By far the cheapest option (and my travel method of choice) is the coach. It can cost under £20 for a return fare and you're dropped straight at the train station in Brugge. I use Go Euro to search for cheapest options; it saved me £10 on my coach home simply by booking my ticket via the French Eurolines website rather than the Belgian one. I nearly always stay in hostels - usually I won't be spending any time there aside from sleeping, and I'd rather have extra money to spend on another trip. The Monsieur Ernest was quite a departure from my usual, but it was nice to have a little luxury for a change. 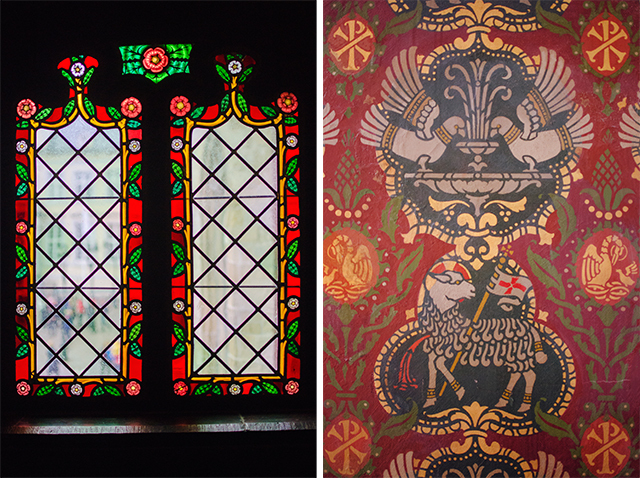 The hotel is styled beautifully, with a mosaic floor and a huge iron staircase cutting through the hall, dark walls and some great palm print wallpaper in the bar rooms. A double bed to myself is a luxury I rarely get these days, and I slept so well I briefly considered stealing a pillow. I booked my room using air miles, and I was expecting the usual room prices to be a lot more expensive than they are, but you'd probably pay more for a Travelodge in the UK. 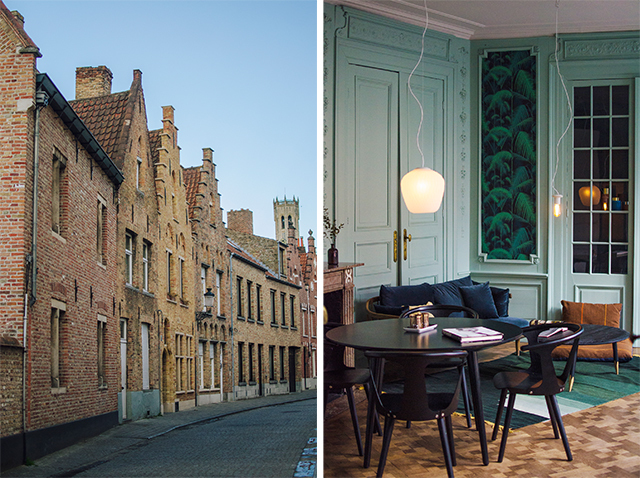 There are plenty of other hotels in the historical centre for reasonable prices, and if you're really on a budget there are hostels within the city walls starting under £20 a night (the Lybeer Hostel on Korte Vuldersstraat looks great). I only took my average sized backpack with me on the trip, but ten hours of carting it around on the day I arrived had me feeling like it was filled with bricks - for a minute or two, I thought about jumping on a bus from the station to the centre. Once I got across the road and had a glimpse of the canal leading to Minnewater, I abandoned that plan and instead wandered the couple of kilometres up into the city. 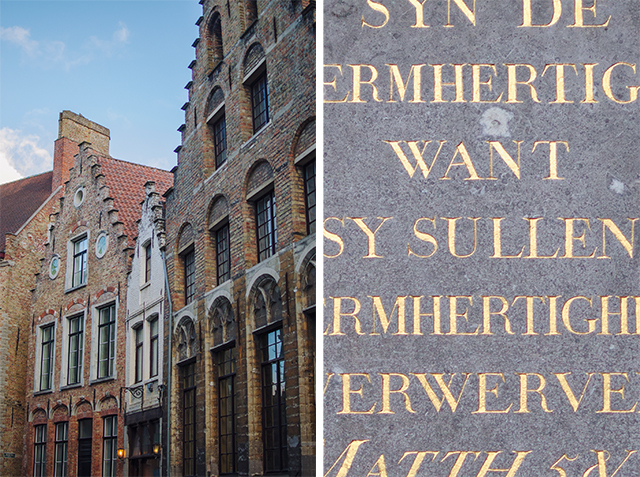 This is the best rule for Brugge: if you can walk it, walk it. 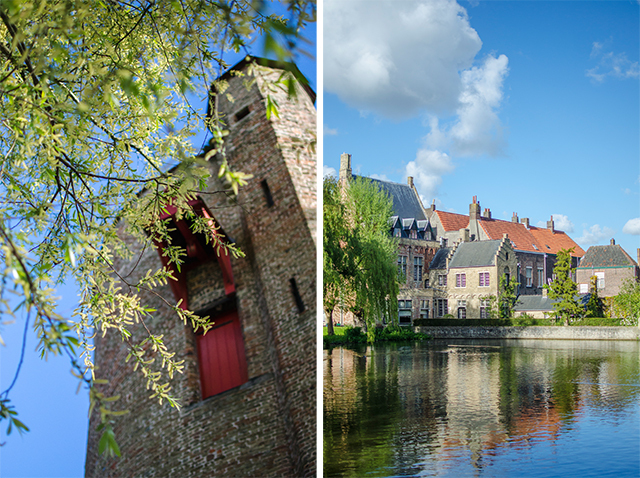 The Poertoren (Powder Tower) formed part of the city's defences from the late fourteenth century and sits on the bridge at the south end of the lake, with a lovely view up to the lock house. 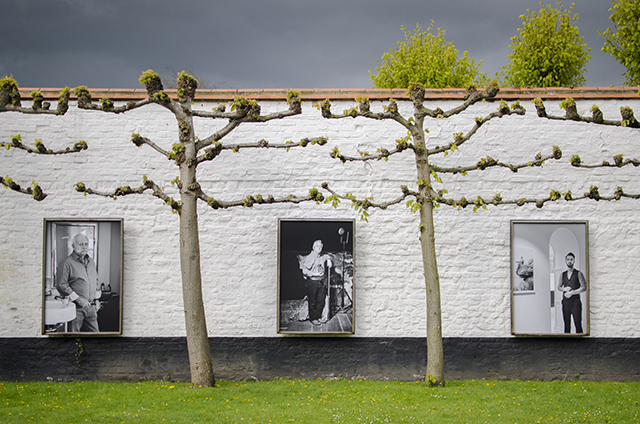 I managed a quick walk around the tree-filled yard of the Begijnhof, admiring the white painted houses which were home to the beguines, before the nuns ushered the last straggling visitors out. A couple of streets up on Walstraat there's one of the Dumon chocolate shops, where I picked myself up a few dark chocolate caramel creams to take home. 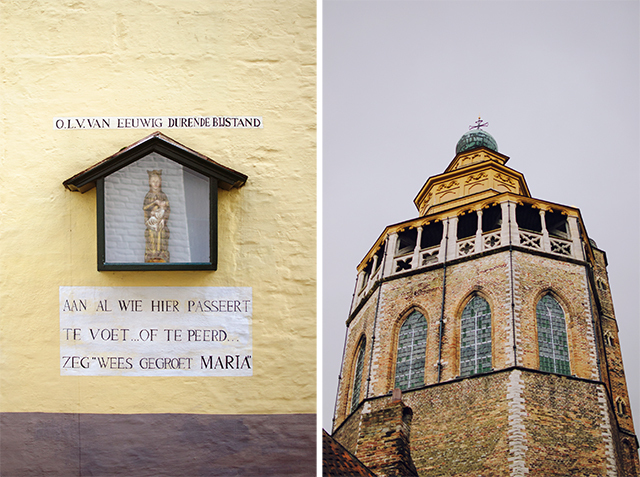 The rest of my walk to my hotel on Wulfhagenstraat took me up via Mariastraat, past Onze Lieve Vrouwekerk, which houses Michaelangelo's Madonna and Child sculpture. Construction on the church began in the 13th century and continued for centuries, culminating with the brick spire which towers over the street at a height of over a hundred metres. 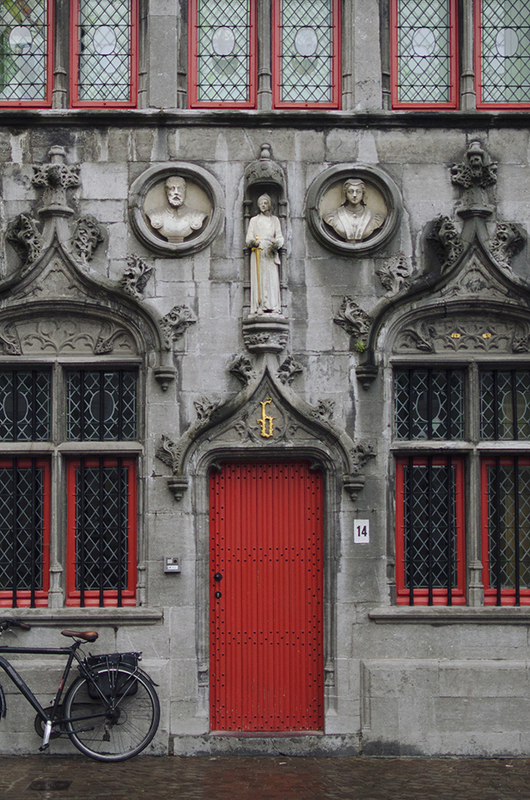 Just opposite is Sint-Janshospitaal, one of the oldest hospital buildings in Europe. I didn't get a chance to see inside this time, where you can visit the old infirmary's museum of artefacts collected by the nuns, as well as the apothecary's garden and the work of famous Flemish painter Hans Memling. My route also took me by Sint Salvatorskathedraal, Bruges' oldest parish church, which has some impressive tapestries and Flemish paintings. Whilst these streets are quiet and most of the museums shut during the evening, they make for a beautiful walk. After dropping my bag at the hotel, I resisted the urge to jump straight into the giant bed and instead headed straight back out to get a look at the historic market square before it started to get dark. The Markt has been used as a meeting place for hundreds of years, and is ringed by beautiful buildings: the Belfort tower and the Provinciaal Hof being the most impressive. The Provinciaal Hof isn't particularly old (it was finished in the 1920s) but has a fantastic neo-gothic facade; the Belfort on the other hand, is part of a complex of halls which date back to the 13th century. Climbing the nearly four hundred steps of the tower gives a great view over the city, and on the way up you can have a look at the treasury or the 47 bells of the carillon. I finished off my evening by walking through to the Vismarkt, where fresh fish is still sold each morning under the arcade, and nipping into a restaurant for some Flemish stew. Right around the corner is the Rozenhoedkaii, one of the most photographed spots in the city: this wide section of canal reflects the Belfort tower and the warm glow of the other buildings in the water. I woke up the next day to heavy rain, but took the rainbow from my window to indicate a bit of sunshine, grabbed some breakfast and made sure to be on my way for 8:30am. Most attractions aren't open until 10am, so I had a little time to kill. 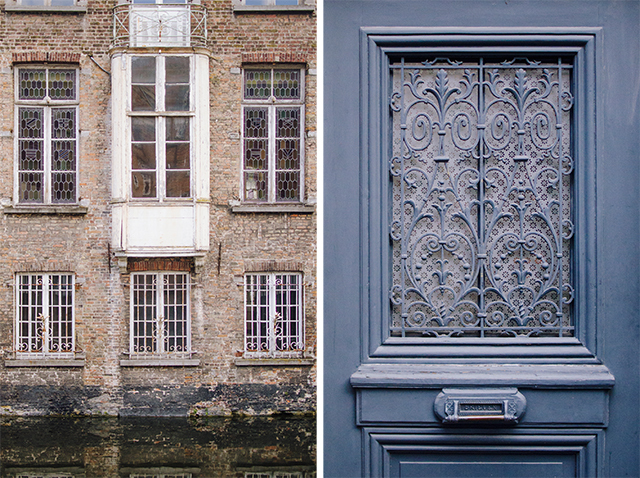 I walked along the quieter side of the canal to the northeast of the city centre, taking in the quaint streets and the backs of the larger houses along the water. 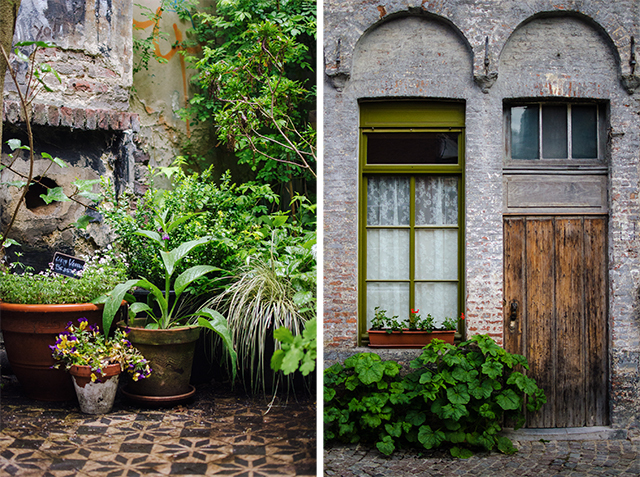 Here on Pottenmakersstraat I stumbled across Pottenmakersgarde, a miniature (and very well cared for) public garden in a ruined cottage - it's a lovely stop off. 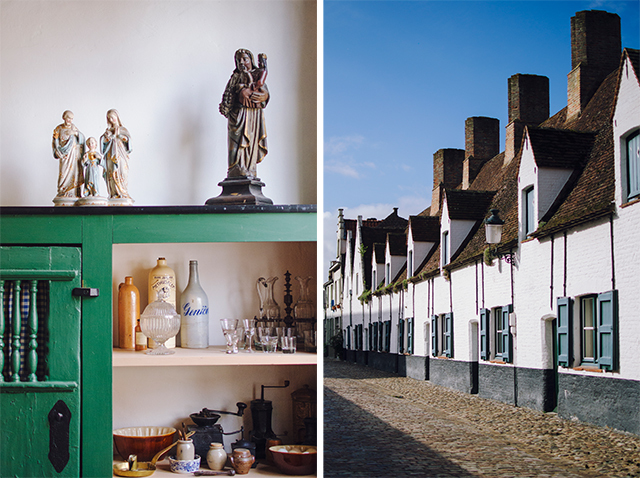 My destination was the Volkskundemuseum, a small museum set in converted almshouses which reconstructs elements of traditional Flemish life: there's a classroom, a grocery store, a pharmacy, a sweet maker's and several other little rooms recreated, often with interiors saved from original shops in Brugge. Alongside these rooms are displays of objects relating to popular culture, from religious artefacts to smoking paraphernalia. 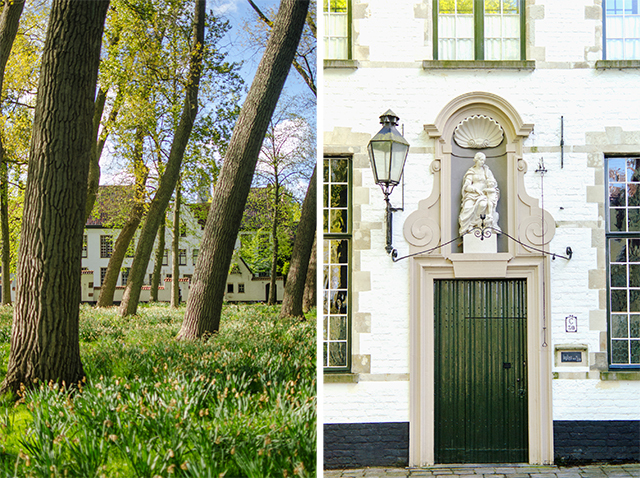 The museum even has its own inn, De Zwarte Kat, and a real life black cat (Aristide) who wanders the grounds as a museum mascot! It's well worth the €4 entry fee, and you can get a combined ticket to the Kantcentrum on the same street for €6. 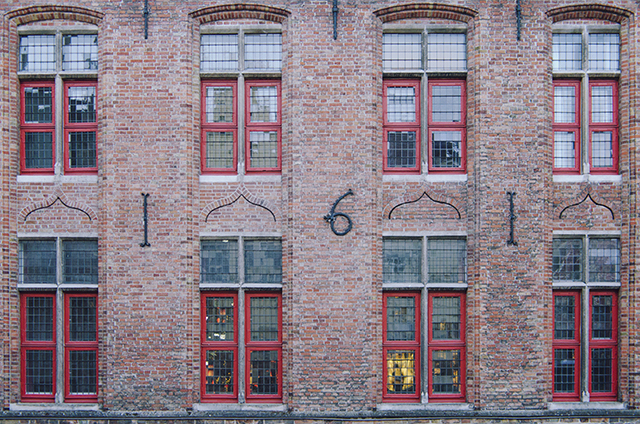 This little museum has displays relating to Brugge's long-running lace making industry, and each afternoon has demonstrations of traditional techniques (the results of which you can buy in the shop). With time getting on I started winding my way through the smaller streets back to the central areas, walking along the Groenerei canal and peering through the rain at the houses and boats. 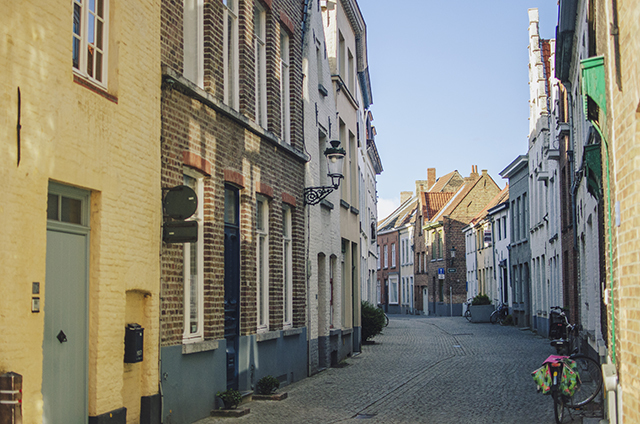 This walk took me back to the Vismarkt, and this time I made a right under the little arch of Blinde Ezelstraat into the city's second main square, the Burg. 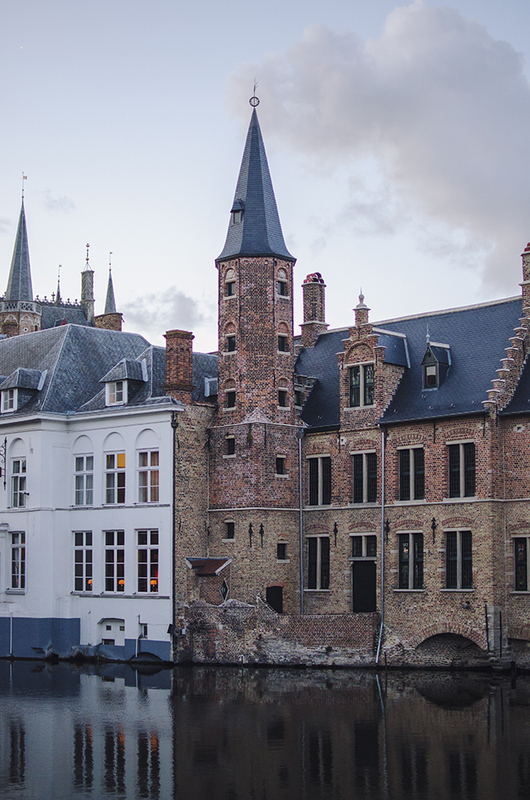 Originally in this square was a fortress and later the Sint Donaaskathedraal, neither of which survive, but you can see the cathedral foundations in the basement of the Crowne Plaza Hotel if you ask at reception! 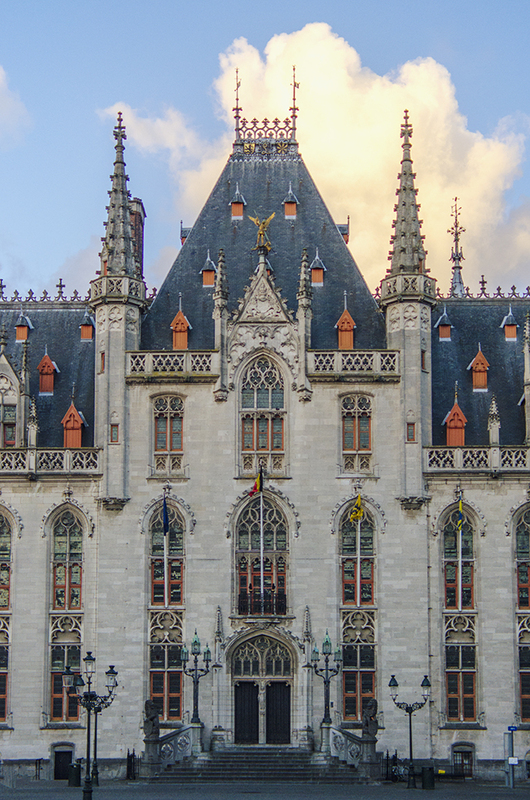 Here is also the beautiful gothic Stadhuis, and my final stop in Brugge: the spectacular Heilig Bloedbasiliek. The lower chapel is dedicated to St Basil, and the upper chapel holds an important medieval relic - a vial supposedly containing cloth with Christ's blood. The richly painted interior of the upper chapel, whilst not particularly old, is very beautiful. After watching the relic brought out for veneration, I finally started my walk back to the station, following the Dijver to the picturesque (but packed) Bonifacius Bridge, before heading down some quieter streets to Minnewaterpark and my awaiting coach. 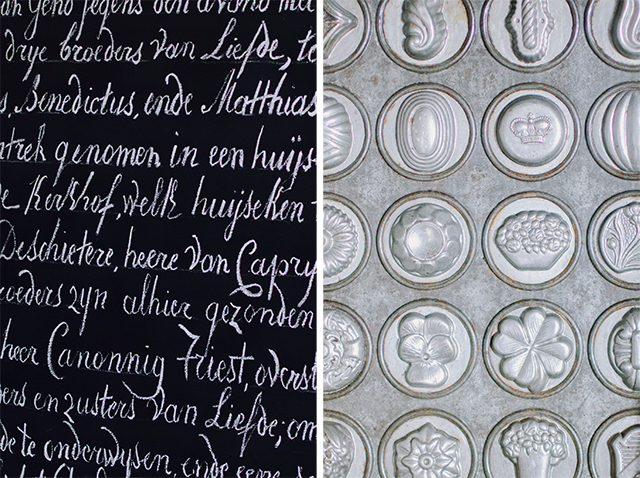 For the next trip: more street wandering, another box of chocolates from Dumon, climbing the Belfort, a look inside Sint-Janshospitaal, viewing the Flemish primitives at the Groeningemuseum, and a visit to the windmills.